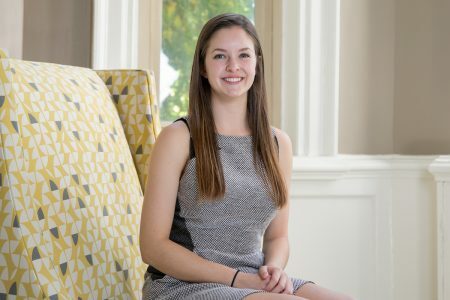 This fall, Rebecca Lesnak ’19 became the first Randolph student to intern for Kakenya’s Dream. Founded by Kakenya Ntaiya ’04, the nonprofit organization works to empower girls in Kenya through education. For her internship, Lesnak is working remotely from campus to advance the mission of the organization, using her skills as a global studies and history major. What’s the title of your internship and what are your responsibilities? I am the development research intern for Kakenya’s Dream. I research possible grant opportunities for the organization using NGO databases to note possible sources for funding. Along with this, I keep track of current statistics that are important to the work that Kakenya’s Dream does, such as education for girls and the dangers and policies of female genital mutilation (FGM). I keep these statistics up-to-date by searching local, national, and international sources. How did you find out about this opportunity and why did you want to do it? I found out about this internship from the wonderful Career Development Center, and they emailed me over the summer with the opportunity and the information I needed to apply. I wanted to do it because I had heard stories of Kakenya and her work during my first year at Randolph, and I admired all that she did and overcame to make such a positive change in her community. I was excited to become a small part of that. What’s your major and what are your future plans? My majors are global studies and history, with a minor in economics. When I graduate, I plan to attend graduate school and study international development. With this, I hope to work for the U.S. State Department or an NGO. What are you learning through this internship that will help you in your studies at Randolph? Through this internship, I am gaining research skills that are valuable to my time at Randolph and my future career. Along with that, I am learning a lot about how NGOs work and the importance of empowering girls through education.